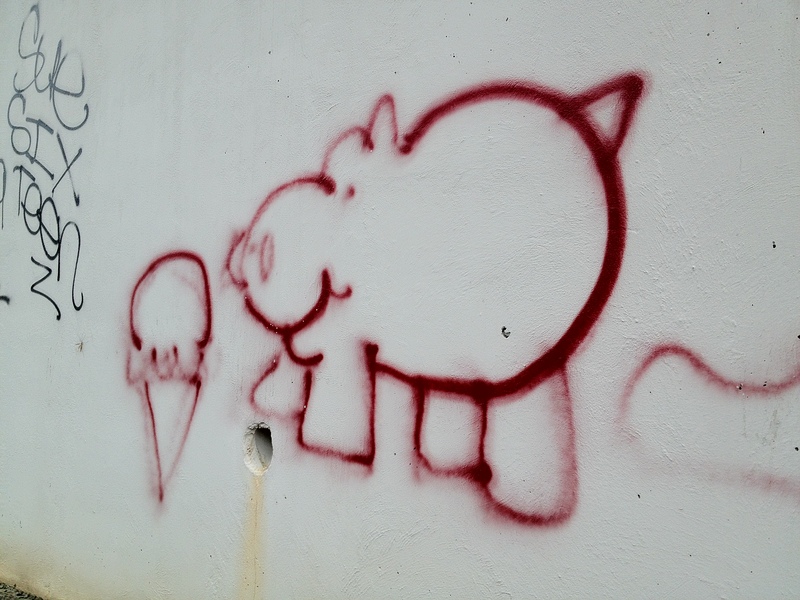 Other times, the graffiti I see is an image involving chimerical creatures or abstract art, and sometimes it’s a whimsical creation like the one below…a pig (or a hippo) preparing to devour an ice cream cone. The juxtaposition of these two items makes absolutely no sense; there’s no symbolic meaning I can glean from it. At one time, when I lived in a world that wasn’t as hyper-decorated as my current home city, I might have poured over this image searching for some hidden truth or imbedded message. Now, eh, not so much. It’s just one more polychromatic embellishment that gives the place character. Ben and Jerry should name a flavor after this. I mentioned in a previous post that while I find graffiti interesting, I neither support it as an art form nor wish to outright ban it. If a building is abandoned, by all means, scribble on it you various types of ne’er-do-wells. One man’s crumbling brick wall is another man’s canvas and all that. However, if someone is living in it or attempting to run a business out of it, keep your Krylon to yourself, taggers! However, just when I think I have my mind made up on a subject, I see new factors that compel me to reconsider my beliefs—even about something like graffiti. Driving home the other day, I saw this little gem on a wall behind a business that’s near railroad tracks. Take a look…. There are two interesting things to note. One, this scribble is one hundred percent legible. Points to the teacher or parent who was a stickler for proper penmanship. After all, there’s nothing worse than having something earth-shaking to say and no one being able to read it because you couldn’t be bothered to follow the rules of cursive. Two, this provocative declaration is without a single grammatical blemish. The correct homonym (There’s) has been selected, the apostrophe is in the right place, “probably” is spelled correctly, and there is even an appropriate use of an ellipsis (…). Granted, it’s in all caps, but one can hardly fault the seeker who penned the statement. Spray paint is dash hard to work with as a medium, and, truth be told, the statement he or she is making might merit the loud delivery. Judging by his or her peers, I firmly believe someone of passable intelligence wrote the message I captured on my camera phone. The handwriting and grammatical correctness tell me as much. Not “There’s no God.” or “How can there be a God?” or even “Where is God?” No, this individual is stating that there is no God, but even in that assertion there is no certainty because of the choice to use “probably” as a modifier. Why waste both time and paint (not to mention risk getting arrested) to make a statement like this? Usually, they are quick posts made by a person who thinks he or she has answers to life’s questions (most of which involve a curse word for some reason). This person wanted to leave a half-finished thought behind for others to chew on, one that just happens to involve one of the most important and most hashed-over questions in the universe. This is a statement that demands an answer from believers, and it is proof that evangelism is still vital in our world. This young person is prompting a discussion about the Lord’s presence with his artistic sojourn—this shrug of the shoulders made with obsidian paint. It’s almost like he’s daring us to retort, not because he wants to enter into a debate in an attempt to prove us wrong. This doesn’t strike me as the work of a hardened atheist whose heart is closed to the teachings of Jesus Christ and is unwilling to hear. This person needs to be found, needs to be told about Christ and gently compelled by the Holy Spirit to take in the world around him in all its wondrous glory. A Christian needs to take this person and usher him into the very throne room of God as we have all been at times in our lives. After all, anyone who has ever witnessed God at work will tell you that it is impossible to deny His handiwork or His presence once you have been shown. You simply cannot “unsee” God. After experiencing His love and power, the word “probably” can never exist again in your vocabulary. Now that I’m older, I’m coming to understand just how essential the Great Commission is and how working in the power of the Holy Spirit to witness to others and share the love of God is vital. Millions of people in my city alone are lost and hurting tonight, and all of it is needless. Someone who knows what Jesus Christ was willing to do to redeem us has no need for drugs or the empty promise of another’s body for comfort. Everything is different when He’s in the middle of it. That’s why we must “open their eyes so that they may turn from darkness to light and from the dominion of Satan to God, that they may receive forgiveness of sins and an inheritance among those who have been sanctified by faith” in Jesus Christ (Acts 26:18). 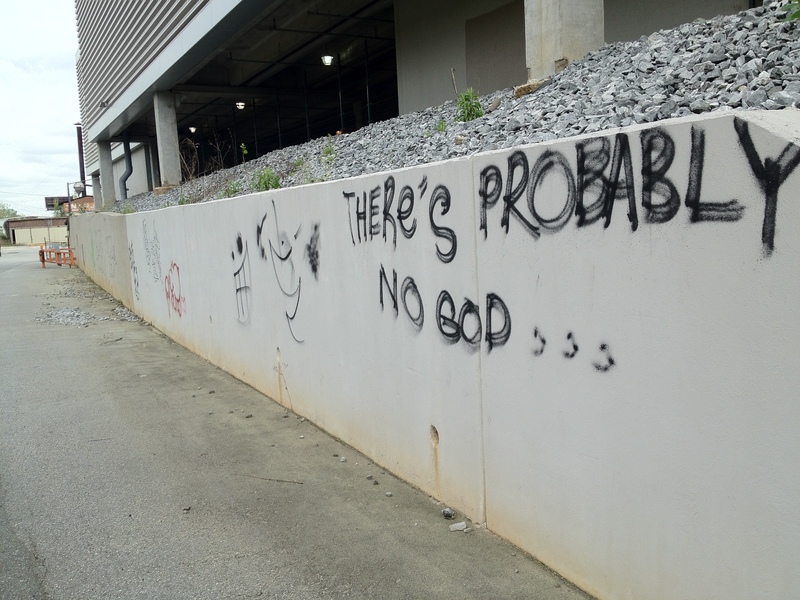 I think about the young man who wrote, “There’s probably no God…” and ache for him. Is his heart seeking answers as mine once did? How will he find them if I’m not willing to go and tell, to leave my own message to the world on that same wall, written in red, next to his…. Next postJoey Chesnut Ain’t Got Nothing On Me! All this ‘detailed analysis’ seems like you’re trying to sound clever, and like you’re not offended. It’s doing the opposite. This is a harmless comment simply stating true probabilities. It is very unlikely that there’s a God. I find it odd you feel a strong compulsion to go and convert him into a Christian, as you yourself said…hmm. Sir, thank you for taking the time to read my blog and comment on it. I would like to address each of your statements individually. 1. “All this ‘detailed analysis’ seems like you’re trying to sound clever, and like you’re not offended. It’s doing the opposite.”—I view this as an uninformed biased presuppositional belief statement. Do you intend for me to believe that you can read my mind and tell me what I am thinking when I write my blog? Do you contain absolute knowledge of all of existence such that you could condescend to tell me what I am “trying to sound” like? I “sound clever” as you say because, well, I am clever. (At least, my mom says so.) If you read other posts on this blog, you will see that I write using the same style, tone, syntax, and diction regardless of the subject matter. My cleverness emerges in posts ranging from God to Gomer Pyle. There is nothing in this post to indicates I am “offended” because I was not. I never will be offended by someone speaking his mind, but if he is incorrect in his thoughts on eternal things, I will never stop trying to convince him otherwise. Your claim that what I say is “doing the opposite” is assumptive language stated as though an absolute truth. 2. “This is a harmless comment simply stating true probabilities. It is very unlikely that there’s a God.”—Indeed it is harmless, and it’s actually not novel. In regards to your statement that this comment is “simply stating true probabilities,” do you have any empirical, measurable, repeatable, directly observable evidence for this supposed “true probabilit[y]”? In truth, your assertion that the existence of God is unlikely is actually an unsupported a priori presuppositional belief statement requiring interpretation of the available evidence. 3. “I find it odd you feel a strong compulsion to go and convert him into a Christian, as you yourself said…hmm.”—You are obviously not familiar with the Great Commission or Christian apologetics. 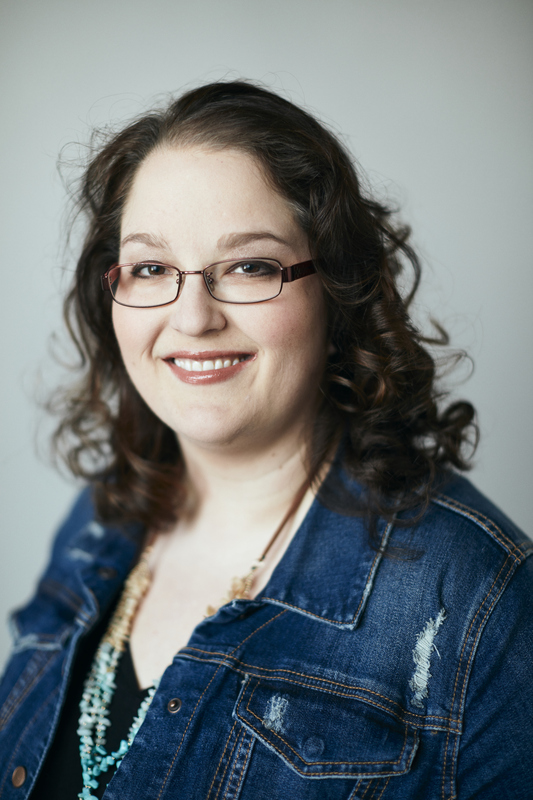 As a believer, yes, I am compelled to share the gospel with this person–with all people I meet actually. It is only through sharing my testimony with others that I can help them come to the same understanding I now enjoy. All I can do is present the truth; it is up to the Holy Spirit to do the rest. I will never know which of the people I speak to will accept Christ. That is why I must tell everyone. It is not “odd” as you put it; it is obligatory. Fantastic answer. I’m very honored by the thoughtfulness of your response. Thank you for sharing it with me – gives me some things to think about. My pleasure, Larry. Come by any time you’d like to read or discuss. I don’t know all the answers, but I love looking for them and sharing what I find. I’m really sorry if I came across that way. I was probably having a bad day to post a comment this rude. I am of course an atheist, but I certainly didn’t want to communicate in a manner which made me look like anything less. Very sorry. No worry at all, sir. Like I said, none of us are perfect….least of all me. You’re right, Andy. I suppose I rarely react to what people say because I think about the many hard things I’ve said and how God has forgiven me. None of us is perfect, but we all deserve the chance to learn and to speak out minds along the way. The only way we come to understand God is by questioning Him, and He’s always more than ready to answer! Sorry to hijack the interaction there. I always enjoy your writing, Jamie, as I know you’re a very considerate and thoughtful writer and I got upset when I saw someone putting words in your mouth. Was a little hard on Larry. Sorry for that. I think this is a great thing. 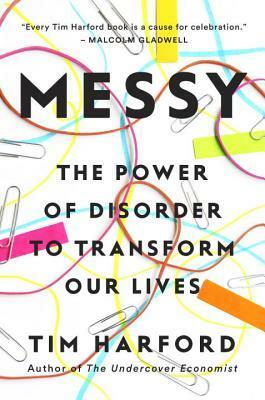 The only way people with different viewpoints can achieve anything is by doing exactly what we did here. There’s hope for the human race after all! Hooray! I wonder if anything more was meant to be there. He had ample room to finish the thought if there was any more to be had, but there is still some “what if” behind those three little dots. You’re right, this is some pretty wild stuff, a cut above what you would typically see on a wall.